Joe Peel graduated from E.L. Meyers High School in 1935, where he lettered as a lineman and also previously at Schuylkill Haven High School. He played in the Wyoming Valley All-Star football game in 1934, and graduated from Meyers High in 1935. Joe earned a football scholarship to Penn State University, where he lettered four years as a lineman. Coach Bob Higgins is quoted as saying “Joe Peel was one of the most unforgettable linemen at Penn State.” Joe co-captained in his junior and senior years with the Lions; in addition, he was elected class president both years. He also served as president of the Student Council and Student Board as a senior. He graduated from Penn State in 1939 with a Bachelor’s Degree in Science, and was named recipient of the Most Outstanding Senior award. 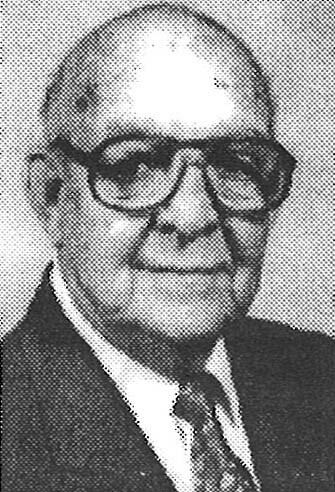 He started his teaching and coaching career at Stroudsburg High School before transferring to Bound Brook High School in New Jersey in 1941 as science teacher and football coach. In 1942, Joe enlisted in the Air Force and served four years as a captain in World War II. In 1946, Joe began teaching science and coaching football and track at J.M. Coughlin High School with another NE PA Sports Hall of Famer Lou Palermo. His teaching and coaching career were interrupted again during the Korean Conflict where Joe served an additional 18 months. Back at Coughlin, Joe was named head football and track coach. In 1957-58, Coach Peel’s team won the Wyoming Football Championship for the first time in 20 years in Coughlin’s history, led by an inductee of last year’s NE PA Sports Hall of Fame, George Koval, who states “He was a father figure besides being a great coach. He demanded excellence in the classroom and because of Joe and his teachings, he helped me through the University of Penn. As an administrator at the U. of Penn., he’ll always influence me with his teachings.” The team was also led by another of this year’s inducted’s, Mr. Joe Perkowski. He was also head football coach of the UNICO East Teams from 1957-1959. Coach Peel also had 5 Wyoming Valley championship track teams in the 1950’s. Captain of the 1956 championship team and undefeated miler and half-miler and 1956 Athlete of the Year at Coughlin Tom Hurley, now a school psychologist at Toms River School District in New Jersey said, “Joe Peel is a master motivator. His genius is knowing when to push and when to stroke. Those of us who played for him would gladly try to move a mountain at his request. The lessons he taught us apply not only to the games we played, but more importantly, to the lives we lead. His legacy of wisdom, patience and perseverance lives in the hearts and minds of all of us who were fortunate enough to call him coach.” Also Paul Gritman, undefeated in his junior and senior years in the 100-yard dash, 220-yard dash, and 180-yard low hurdles, was quoted as saying in the Times Leader newspaper “Coach Peel was more than just a coach to me; he was a true teacher. I will always remember the values he taught me on and off the field.” In 1960, Joe became an administrator in the Wilkes-Barre Area School District, first as an assistant principal at G.A.R. Memorial High School, and then assistant to the superintendent before retiring in 1980. Joe and his wife, the former Peggy Greenfield, currently reside in Charlotte, N.C., and are the parents of 4 children, Joseph W., Laurie, Robert and Thomas.